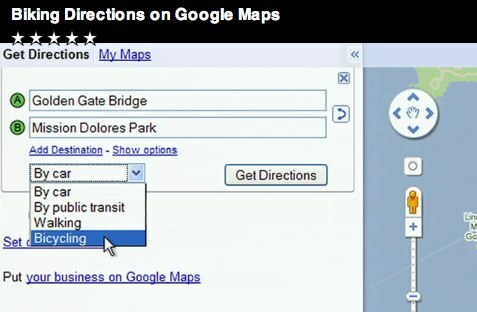 We're so happy Google Maps now has directions for cyclists! We’ve explained several times this year that technology alone is not enough to solve our world’s mobility problems. Recent solutions that we’ve reviewed, like the Google-funded Shweeb, China’s plans for car-straddling buses, and “collision-free” robot cars are all interesting ideas, but they can’t replace our more basic needs for integrated land use and transport planning. Nevertheless, it’s hard to ignore some of the recent tech innovations that have helped re-shape the way we move around our cities and force us to imagine mobility in the future. Here’s a round-up of our posts covering some of the best and brightest (and fun!) technological innovations for transit. CONTACTLESS CARDS: Riders will now be able to pay for public transportation and taxis in New York City and Los Angeles using cell phones or credit cards, thanks to new technology from Visa Inc. India is also working on a transit card that will grant users access to the country’s diverse modes of transportation with the wave of a single card. District Department of Transportation (DDOT) Director Gabe Klein unveiled on Monday a new multi-modal information screen, a prototype for those that the department will be placing in bus shelters and at major pedestrian activity centers throughout the District as early as this spring. DIGITAL DISPLAYS: The technology is not new, but it’s still a first for Washington, D.C., which has spent the past year devoted to many sustainable transport projects, like ramping up cycling infrastructure, opening transit data for public use, and revitalizing its streetcar network. The District Department of Transportation (DDOT) unveiled a new multi-modal information screen that combines information about D.C.’s two bus systems—Metrobus and the Circulator—Metrorail, Capital Bikeshare, and ZipCar, a car sharing service. This information is presented in a simple, visually appealing format, along with an area map and weather forecast. WASTE NOT, WANT NOT: Warsaw’s Metro plans to debut a new subway car that’s 97.5 percent recyclable, developed by Siemens and BMW DesignworksUSA. In Paris, an experimental heating system, being installed in a public housing project, will use the warmth generated by human bodies in a nearby Metro station to heat the building. And in Philadelphia, the Pennsylvania Energy Development Authority is building a system that will capture the energy from the city’s subway cars as they brake to enter a station, store it in a large battery installed along a busy line, and then use it to power trains when they leave the station or sell it back to the grid to earn money. THESE MAPS WERE MADE FOR WALKING: A new mapping tool called Mapnificent, powered by Google Maps, lets you pick a point on a map and select a time frame to travel to another location using public transit, walking or biking. For example, the map tells you where you could live or work within a commute of 30 minutes by bus. Elsewhere on the Web: WalkScore released two new tools, Transit Score and Commute Reports, that rate addresses based on public transit options nearby and calculate estimated monthly transportation costs and time spent commuting. TAXI TRANSFORMATION : Taxicabs, because they are shared vehicles, are an important part of the public transport mix. There have been some interesting attempts to give the industry a makeover. For example, Weeels is a new online tool to help you “save time, save money, save energy and save space” by finding people to share a cab with you. 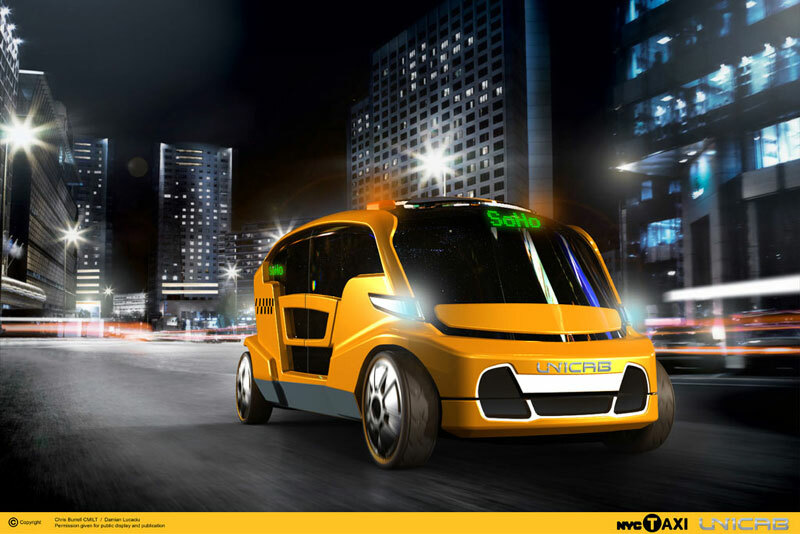 And check out this new proposal for future taxis in New York City: Unicab, a four-seater with a light strong steel body, designed as a fully electric vehicle that also has solar panels on the roof for additional energy, along with brake energy conversion, hydrogen fuel cells, and plug-in recharging. SOCIAL BICYCLES: The New York City-based Social Bicycles System, or SoBi, could help bikesharing go mainstream, with the help of GPS-enabled smartphone technology that allows cyclists to locate, check out and park their bikes. Meanwhile, people are turning to “bike pools” on social networking sites like Twitter and Facebook to find like-minded cyclists to share a ride. THERE’S AN APP FOR THAT: Several new smartphone apps make walking safer, including TextVision, Type n Walk, and Email ‘n Walk. 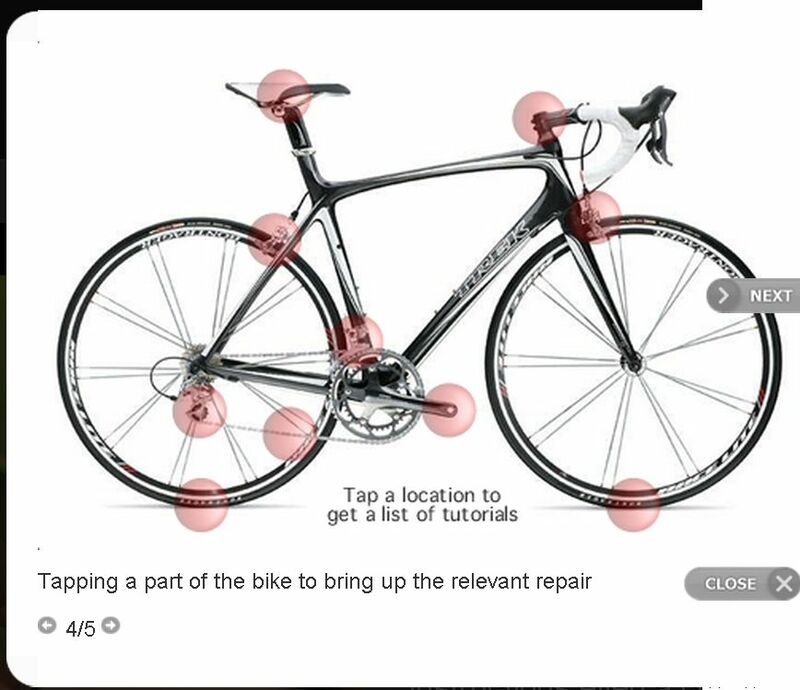 There’s also a new app for the Android and iPhone, called BikeDoctor, that lets you tap a button to diagnose an issue with your bike. It includes basic repairs, like fixing a puncture, and more advanced repairs, like adjusting gears. Looking for more apps? Read our previous post on the subject, or browse City-Go-Round, a clearinghouse of useful online and mobile transit applications across the United States. You can also read this review of the best transit apps, published in The New York Times. E-BRT: Siemens unveiled its new system of electric bus, e-BRT, featuring an optical guide system and automatic energy recharge. Its “ultra rapid energy transfer” takes only twenty seconds, the time it takes for passengers to board and leave the bus. According to Siemens, “the efficiency of e-BRT would be more than twice that of combustion engines and hybrids, with electric traction and recovery of kinetic energy during braking.” What’s more, it eliminates the need for overhead cables. The town of Montbeliard in France has expressed their interest for using this technology in its city bus network. FASHIONABLE AND FUNCTIONAL: Want an alternative to your bike helmet? Try this inflatable collar that opens in 0.1 seconds to protect the skull and neck of a cyclist in the event of a collision. The inflatable collar can be worn with your normal clothes. Photo via the Daily Mail. ELECTRIC WHEEL: Nokia Oyj released a bicycle-powered phone charger, which charges your phone as you ride. The complete charge kit comes with a charger, a dynamo (a small electrical generator powered by the wheels’ motion ), and a holder to attach the charger to the bike. GAMING FOR GOOD: This year, IBM unveiled its new video game, CityOne, which is kind of like SimCity but for sustainable cities, where players act as city planners, dealing with real-life issues related to banking, water, energy and retail. For more ideas, check out Mass Transit magazine, which also published its list of “Top Tech Innovations 2010,” including some fascinating intelligent transport system (ITS) software and hardware, like crime forecasting for transit police, bacteria-killing ultraviolet rays for bus and metro systems, and hybrid streetcars. Dario Hidalgo contributed to this post. Can Pod Cars Transform Traffic in Delhi? Vote to "Drive Innovation in Public Transport"